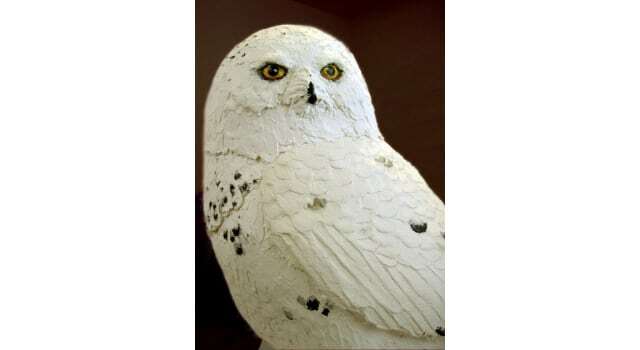 The snowy owl was very close to being finished when I wrote my last post. I got distracted by another project (which I’ll tell you about down below) so the final details had to wait a bit. She’s now really, really almost done. This morning I worked on the eyes a little, to get that slightly irritated look that owls seem to have, and I gave her more feather texture on her chest, legs and cheeks. As soon as the paper mache clay stiffens up a little I’ll smooth out these new feathers, especially around the face, by laying a piece of plastic wrap over the clay and lightly pressing down with my fingers. Then she’ll sit over a furnace register for a few days while she waits for her black spots and orange or yellow eyes. (I’ve seen both colors in photos – does anyone know what color her eyes are really supposed to be? Anyway, you should see the finished owl in a few days. I know that many of you have been working on your own owls, and we’d love to see how they turned out. Now, for that pre-announcement. I’ve been working almost night and day for the last month to finish a project I actually started back in June (the baby chickens are my excuse for letting it sit unfinished for so long…). My part of the project is done, and it’s now up to the printers to do their part. In about a week, it should be available on Amazon.com – my second self-published art book. The book has pictures to color, obviously, but I also added a page of text for every picture. I know this isn’t the way “you’re supposed to do it,” but I never let that stop me. Of course, it does mean that this is a bit of a gamble when it comes to actually selling any – so keep your fingers crossed for me. 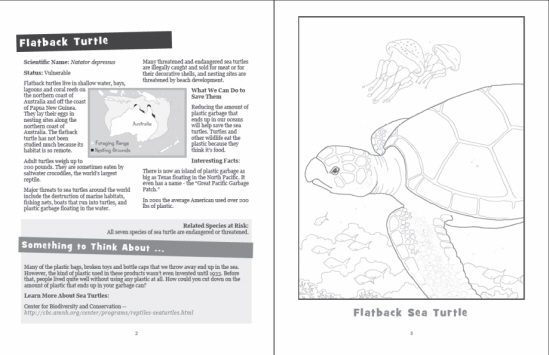 On each left-hand page is a small hand-drawn map, and some information about the animal and the efforts that are being made by conservation groups, governments and local communities to save them. At Jessie’s suggestion (thanks, Jessie!) I also included a section that gives readers a chance to think about things they can do to help. For instance, we learn that sea turtles and other wildlife are endangered because they eat plastic garbage bags and other plastic junk that floats in the water. Since the plastic starts out in our garbage cans, I ask them what they might do to reduce the amount of garbage they throw away. I also included the web address of a conservation group for each animal pictured, a list of other related animals that are also at risk, and a short section of interesting facts – did you know that Asian elephants are more closely related to the mammoth than to African elephants? I didn’t, until I did the research for this book. I can’t wait to see how people respond to this book.Â As soon as it becomes available I’ll ask Amazon to let people see inside the book. I hope you’ll take a look give me some feedback. Now I’m on pins and needles, waiting for the proof copy to arrive in the mail. It should be here tomorrow. Oh, one last thing before I forget. If you haven’t been watching Xan’s greyhound portrait marathon, you’re missing out – she’s even letting us see some of the intermediate stages as she finishes the little paintings, from the original photos all the way through to the final result. Quite inspiring – you can find them on her blog here. Good job, Xan! 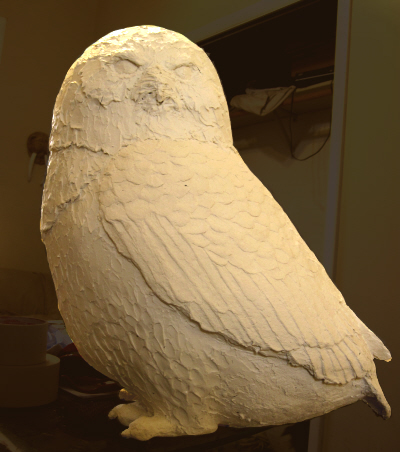 Painting the Owl – the project is finally finished! Jonni, I love your ideas for your coloring book. 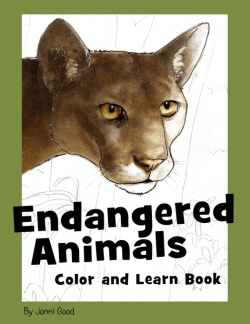 When I was young I always wanted to know more about the animals I was coloring. I think it will be a big hit. Not only can children color the animals but someone can read to them about the animals. It will hopefully help make more people aware about our endangered animals and what we can do to help them. Great…..I can’t wait to see how it is received. Thanks, Karen. That’s why I thought it would be fun to create the book – there’s something quite intimate about drawing or painting or coloring an animal. You almost feel that you know the critter, and you want to know more. Or at least that’s how I always feel. 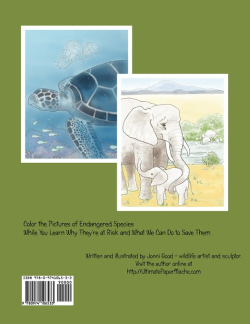 In fact, I concentrate my artwork on animals because it helps me feel like I’m surrounding myself with wildlife “friends.” The book is what I would have wanted when I was in fifth or sixth grade. But I don’t mind admitting that I was a bit weird – I didn’t mind looking up a few words or reading above my grade level when there was something in a book I really wanted to know. In this day of YouTube and video games, I’m not sure if kids have that kind of patience any more. It should be online by the end of next week, if not sooner, so we should know soon… Thanks for your encouragement. Oh my goodness, you sneaky thing! I didn’t know you were working on this. Er. Did I? 😛 Anyway, wow! I’m so impressed. This is something I’ve wanted to do for ages, in some back corner of my project-list-mind. Congrats! I eagerly look forward to its release, and to the feedback. I’ve been pretty busy myself, but I’ve subscribed to your blog and comments, which I get by email every day. Several times a day! It’s so cool to see everyone’s projects and interactions. I’m letting some paint dry, and thought I’d jump in and see if I’d missed anything, and there you’ve mentioned ME! *blush* Thanks, Jonni! The marathon is always fun, and really packs a lot of learning experience into a concentrated time for me. I’d welcome anyone’s feedback if they want to take a look over there. Thanks Xan. I’ve been watching you paint up a storm lately – what would we do without these email notification thingies? No, I don’t think I mentioned the coloring book to anyone. It sat on the shelf for a long time, waiting for just the moment to grab my attention. Then, when I finally picked it up again, I had so much fun I couldn’t put it down. Some projects are like that – they just have to wait their turn, I guess. Let us know if you do put out that book you’ve been thinking about for so long. This self-publishing thing is fun – I know you’d love it. Especially since you’re already making the cards and prints, and you have your website (fantastic new design, by the way), so a book is the logical next step. I can’t wait to read it. Yes, so true! Some things just wait their turn. *nodding sagely* That sounds good. I will certainly let you know if I do a book. You’ll be on the review team, I’m sure.